Alice + Olivia is the newest brand to debut a See-Now-Buy-Now aspect to their brand. 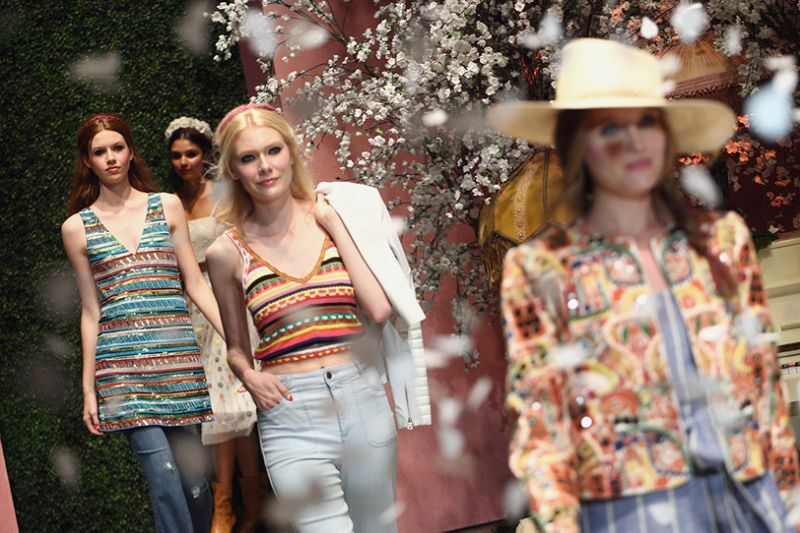 Designed by Stacey Bendet, the brand hosted a Los Angeles fashion show on Wednesday April 13, with twelve exclusive items from the collection on sale immediately following the show. Greatly anticipated was an alice + olivia x Grateful Dead capsule collection that is perfect for Coachella, which debuts this weekend. This is the first See-Now-Buy-Now runway show the company has hosted and the attendees ranged from reality television stars to fashion gurus alike. Hosted at NeueHouse Hollywood on Sunset Boulevard, viewers included Emily Ratajkowski, Kourtney Kardashian, Lindsey Vonn, Anna Paquin, Lydia Hearst, Tori Praver, Mischa Barton, Mia Moretti, Whitney Port, Jennette McCurdy and more. The show was co-styled by Senior Vice President and Fashion Director of Nieman Marcus, Ken Downing. The See-Now-Buy-Now show for alice + olivia follows the CFDA’s release of the results of the Boston Consulting Group’s study in regards to the future of New York Fashion Week as we know it. The study has revealed that there is a need to change the dated Fashion Week system. Designers are prompted to deliver collections to consumers in a format that is rooted in in-season relevancy in the future, both of which alice + olivia directly cites as reasoning behind the idea of their See-Now-Buy-Now fashion show. “It is exciting to be involved in the forefront of a new fashion phenomenon with Stacey,” said Ken Downing. “She has always been wildly intuitive, with the ability to anticipate her fashionable customers’ wants and desires. Creating a highly curated, creative, clever, and in-season fashion show, as only Stacey can do, with a Buy-Now-Wear-Now mantra, makes sense for her fashion followers that love and adore what she designs!” The journey to modernize alice + olivia to match the customer’s needs is one that many brands have been attempting to take. For Bendet, this involves timing her collection to coincide with Coachella Valley Music Festival, the well-known kick off for festival season in the US. From Bendet’s mouth to our bodies: this collection is the perfect addition to our wardrobe for festival season.